Credit Rating Agency Issues Warning On Climate Change To Cities Moody's Investor Services says it might downgrade U.S. cities' credit rating if they don't deal with the risks posed by climate change. 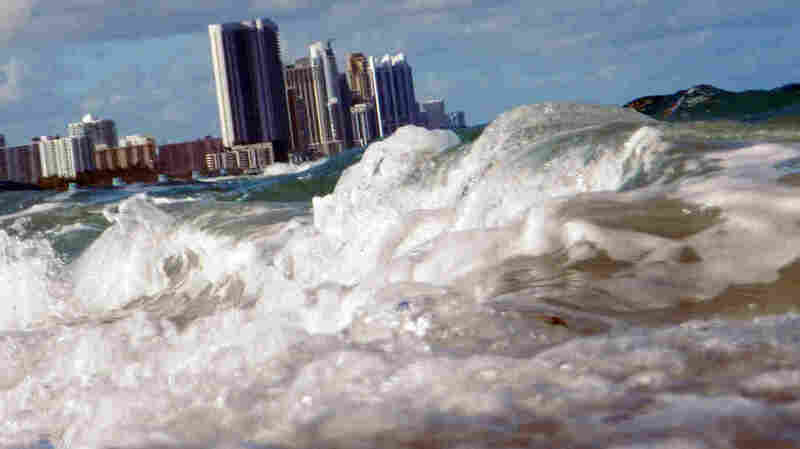 Buildings are seen near the ocean in North Miami. Broward County and many communities in southeast Florida have been aggressive and proactive in preparing for the effects of climate change. In a new report, Moody's Investor Services Inc. explains how it assesses the credit risks to a city or state that's being impacted by climate change — whether that impact be a short-term "climate shock" like a wildfire, hurricane or drought, or a longer-term "incremental climate trend" like rising sea levels or increased temperatures. Also taken into consideration: "[communities] preparedness for such shocks and their activities in respect of adapting to climate trends," the report says. "If you have a place that simply throws up its hands in the face of changes to climate trends, then we have to sort of evaluate it on an ongoing basis to see how that abdication of response actually translates to changes in its credit profile," says Michael Wertz, a Moody's vice president. Ratings from agencies such Moody's help determine interest rates on bonds for cities and states. The lower the rating, the greater the risk of default. That means cities or states with a low rating can expect to pay higher interest rates on bonds. "This puts a direct economic incentive [for communities] to take protective measures against climate change," says Rachel Cleetus, the lead economist and climate policy manager at the Union of Concerned Scientists. Moody's is the first of the country's big three credit rating agencies to publicly outline how it weighs climate change risks into its credit rating assessments. And it's just the latest "market-based signal," Cleetus says, "that what seemed like a far-off distant future gets collapsed into the present and that people have to start making decisions now based on what is already baked in reality for many of these places." In its report, Moody's breaks the U.S. into seven "climate regions," based off of geography, regional economies and expected risks. In the Midwest, "impacts on agriculture are forecast to be among the most significant economic effects of climate change," the report says. The Southwest is projected to become more vulnerable to extreme heat, drought, rising sea levels and wildfires. Rising sea levels and their effect on coastal infrastructure is the biggest forecast impact on the Northeast. Communities that face a high risk of being seriously impacted by the impacts of climate change are being asked by analysts during the rating process how they're preparing for these risks, Moody's says. Jennifer Jurato, the chief resilience officer for Broward County, Fla., says they received surveys from Moody's asking how the community and local government was responding to issues of sea-level rise and flood protection. Broward County is the second-most populous county in the state and is part of the Southeast Florida Regional Climate Compact, which was created to prepare for and respond to climate change. Jurato says Broward County and many communities in southeast Florida have been aggressive and proactive in preparing for the effects of climate change, creating barriers to flood waters, elevating properties, managing stormwater systems and implementing flood management programs. But she says it hasn't always been easy to get buy-in politically. It can be difficult for a policymaker to justify a big investment when the associated benefits or risks seem a long way down the road. Moody's announcement may change that. "Now we've got the incentive on an annual economic basis to make the smart investments that we've been arguing for," she says. "The shorter-term economics are starting to come into play and they'll have immediate impacts on the cost of financing important community projects."